FREE VALUATION. 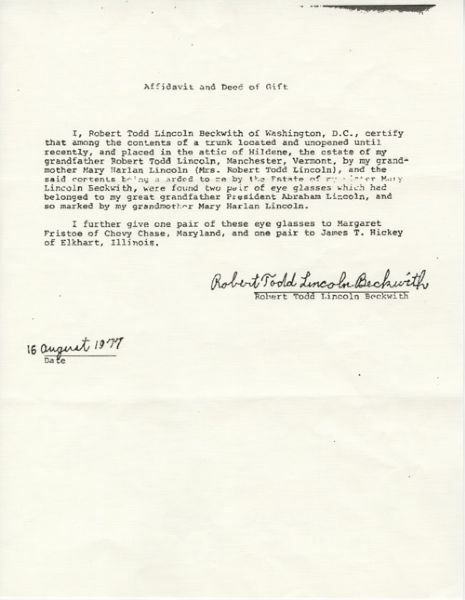 When you are looking to buy, consign or sell Abraham Lincoln memorabilia, Abraham Lincoln autographs & letters or Presidential memorabilia, please go to http://www.NateDSanders.com or email Nate@NateDSanders.com. The Nate D. Sanders Auction House can also be reached at (310) 440-2982. 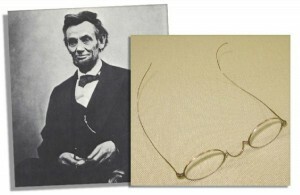 We sold this piece of Abraham Lincoln Memorabilia sold for an incredible $84,422. Also included is a signed letter from a board-certified optician attesting to the prescription of the glasses as +2.12, a match to Lincoln’s known prescription strength in the 2.00 range. The opera glasses owned and held by Abraham Lincoln at the hour of his assassination on 14 April 1865 at Ford’s Theatre in Washington D.C. President Lincoln brought these German-made glasses to assist in his enjoyment of the show, a light-hearted farce entitled “Our American Cousin” starring Laura Keene. During the third scene in the second act, John Wilkes Booth gained entry to the Presidential Box where Lincoln was seated beside his wife, and fired his Philadelphia Derringer pistol into the back of Lincoln’s head behind his left ear. Booth managed to escape the chaotic scene, and Lincoln, unconscious, was carried out of the theater and across 10th Street to a nearby boarding house by a huddle of doctors, soldiers and guards. Among them was a Captain James M. McCamly, an on-duty Washington City Guard and 70th New York Volunteer Infantry veteran. 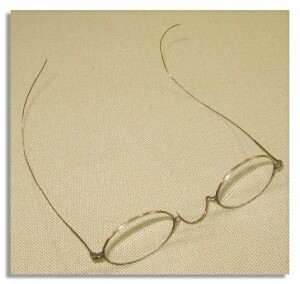 McCamly noticed the glasses had fallen from Lincoln’s body, picked them up off of the ground and put them in his pocket. Abraham Lincoln died the next morning, and McCamly served as commander of the honor guard that was part of the Lincoln funeral procession to his burial in Springfield. Along with the actual pistol that fired the fatal shot, The Ford’s Theatre National Park Collection houses the carrying case into which these glasses fit “precisely,” according to a 1968 letter from the Chief Curator of the National Park Service, Harold L. Peterson. A copy of this letter is included, as is an affidavit from the McCamly family, in whose possession the glasses remained for generations before being bought by the Malcolm Forbes estate. 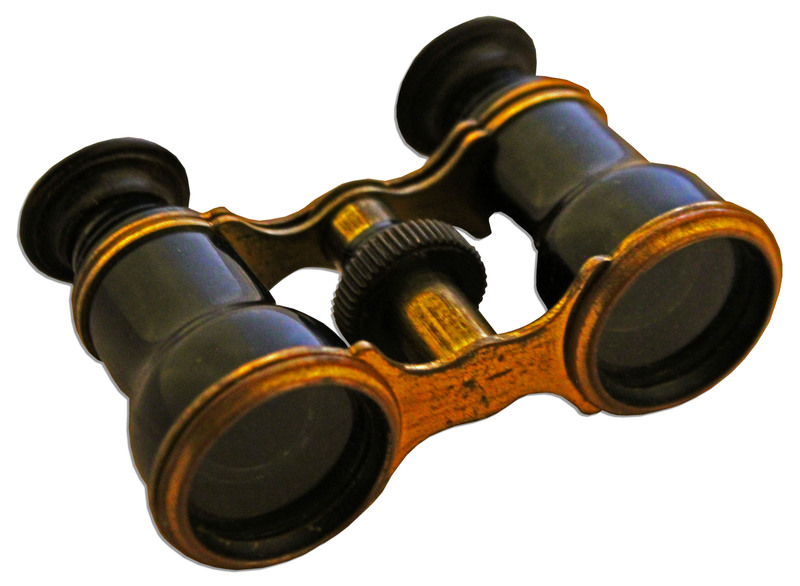 Black enameled Gebruder Strausshof Optiker, Berlin opera glasses measure 1.5″ high, 4″ across at their widest point, and 3.75″ in length when fully extended. Each ocular tube contains a pair of glass lenses measuring .5″ and 1.5″ in diameter with a late-turned threaded eyepiece. Central spindle contains focus adjustment wheel. Gilt metal throughout. One of the small lenses is chipped from the inside. Functional and beautiful artifact from one of the most fateful nights in American history. In addition to the provenance stated, sales history of the glasses will be provided. One of the most valuable items of Abraham Lincoln memorabilia in existence. To view the current auction, click here.